Ginger has fit right in with the rest of the crew. Homer still tries to assert himself over him but they rarely get into anything serious. 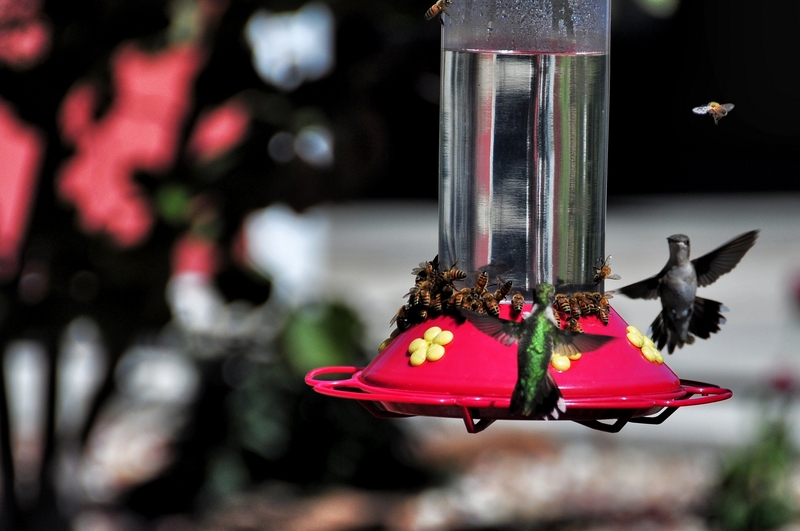 The hummers are hitting the feeders heavily now, and will continue to do so through August. We have five feeders up and refill them nearly everyday. 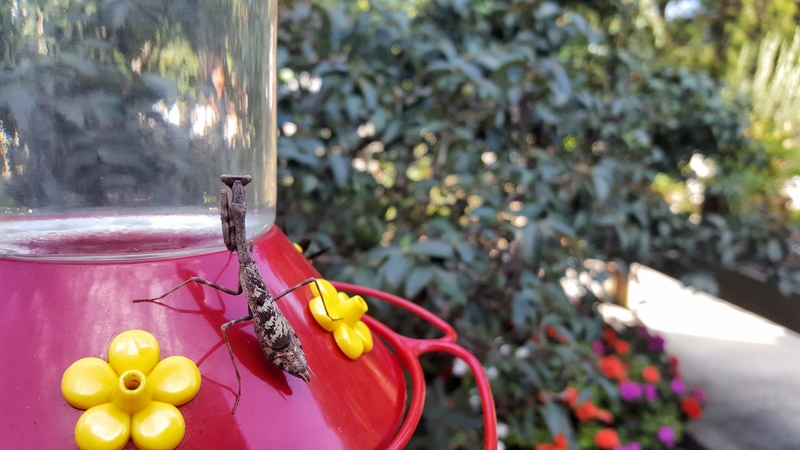 Saw this gal on the hummers’ favorite feeder the other day and nudged her off. She came back to it yesterday. I’ve seen them on there before. 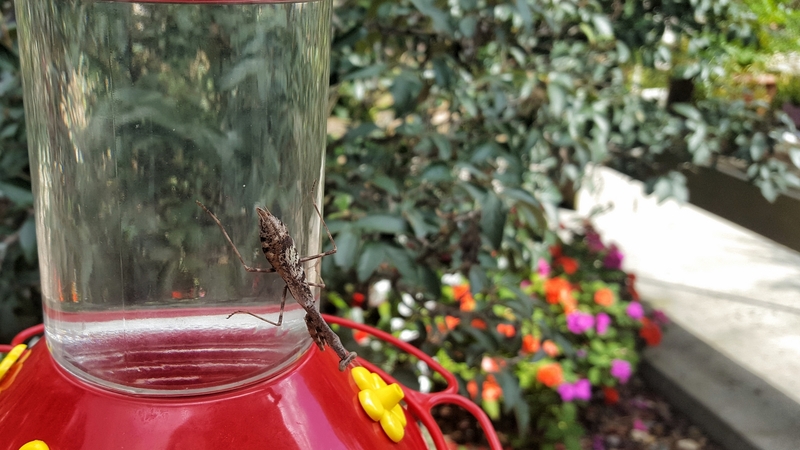 I took a few pictures of this one a couple of years ago and didn’t think any more about it until someone mentioned that they have actually captured and eaten hummers. That kind of freaked me out. So I flipped her off of the feeder again. Remarkable how much grip they get on plastic and glass. I wish I had waited a little – there was a wasp just the other side that I didn’t notice until the mantis was on the ground. You can just make out the tips of the wasp’s wings in this photo. Click on the photo to for larger size. 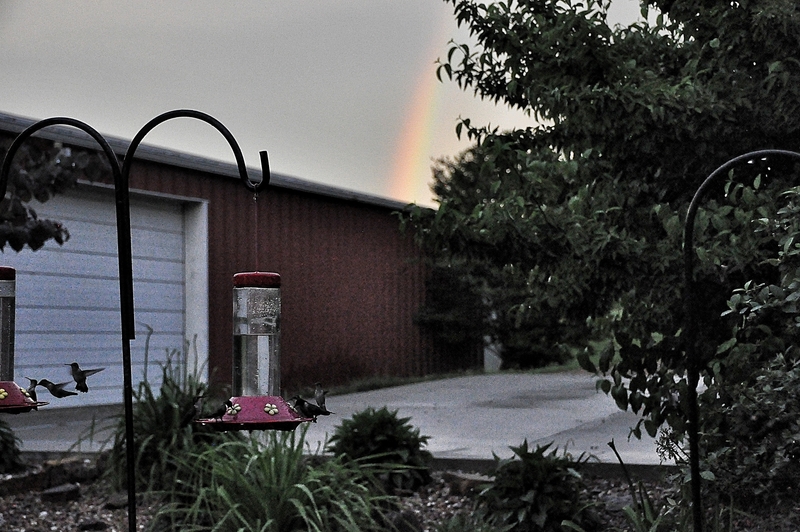 For some reason, my flock of hummers has a favorite feeder. 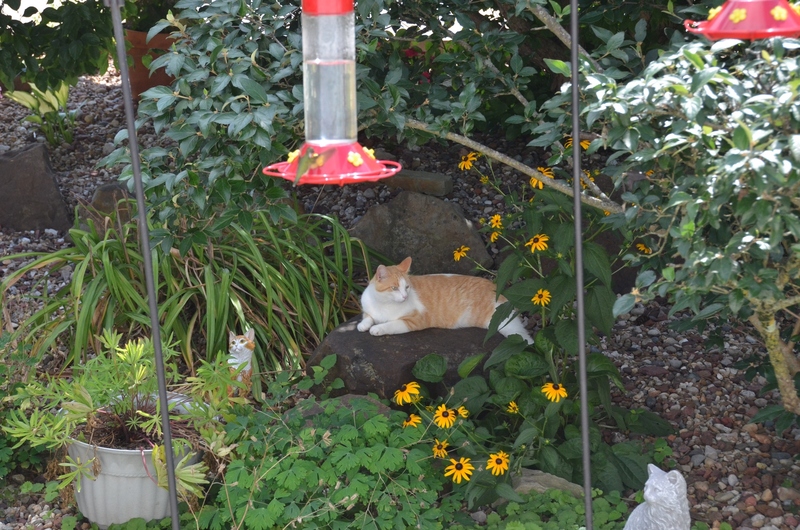 The feeders are identical, and I have moved them around so I don’t think it’s a particular location. I’ve filled them all from the same batch of nectar so it isn’t taste. The feeder you see them swarming in the video is the one they’ve chosen, I’ve filled it three times today while the other four are still on the first fill. : whoops, I have my phone set to take max resolution video and it’s taking a long time to load, sorry ’bout that! We often see wasps at the nectar feeders but this is the first time I’ve seen this many honeybees at one. First time I’ve seen this many honeybees in a long time, actually. I wonder if they are a new swarm looking for a nest site and stopping by the feeder on their way. 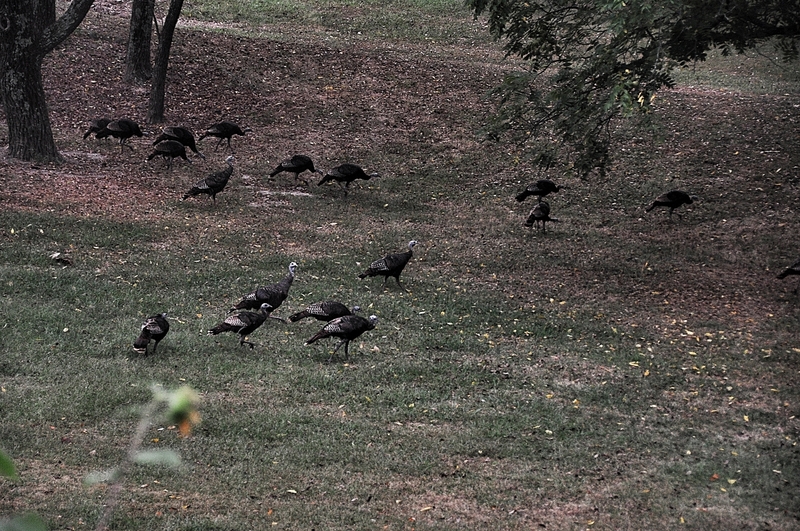 I think they just call an assembly of turkeys a flock, but a swarm would work. Or a congress. That one may already be taken. 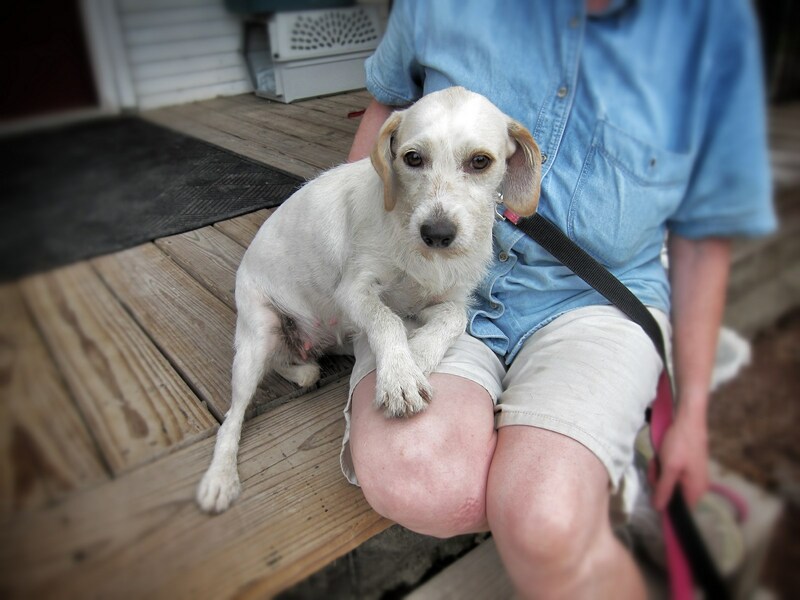 Here’s the male of a brother and sister pair of terrier mix puppies. And the sister. Mrs J said the previous owner took ill and was put into a nursing home by his kids. They turned the dogs loose. They were picked up by a neighbor and kept until the shelter had an opening. 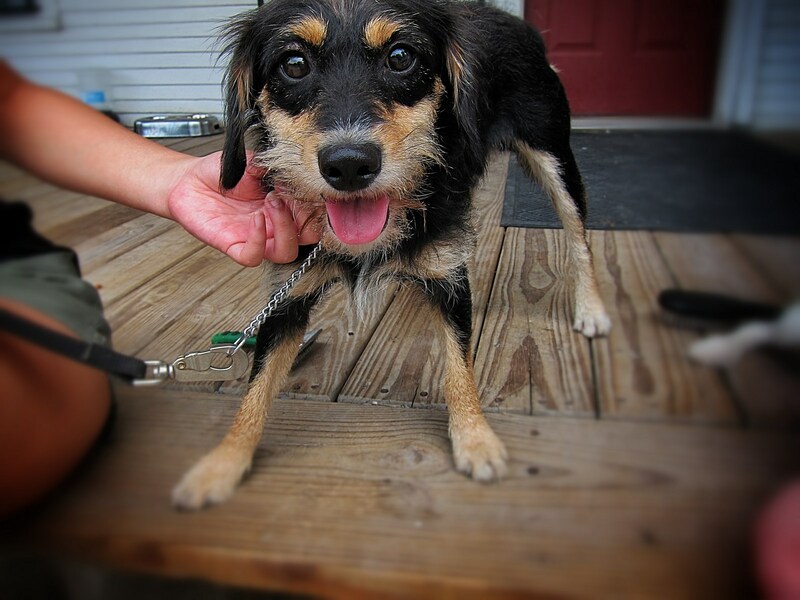 They are leash trained and housebroken, their meds are up to date, and they will be spayed and neutered. 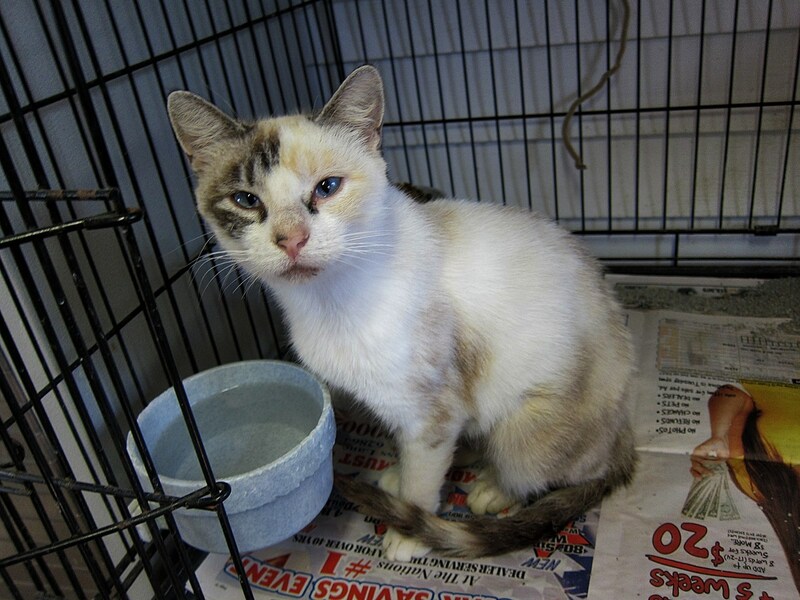 Here’s a kitteh, one of those that were part of the colony that came down with a respiratory illness. 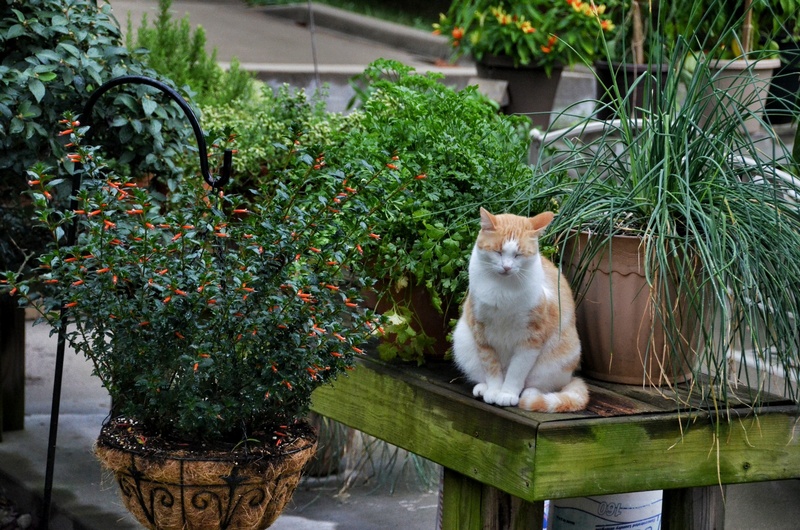 A visit to the St Francis Facebook page will yield more info on the dogs and cats. And a quick update on the ongoing Katie integration project. 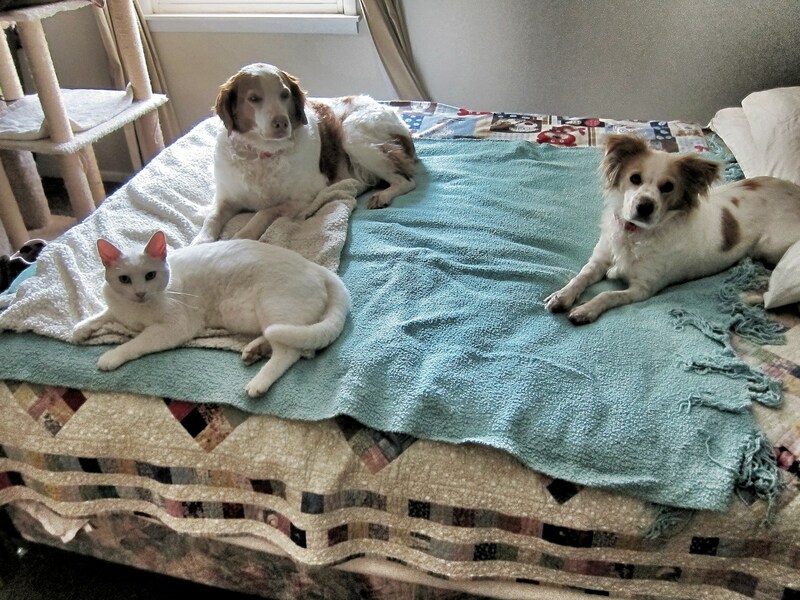 Here she is with Bea kitteh and Annie, the Brittany Princess. She loves her some Mrs J but would prefer to not be in the same room with me, unless I have a treat in hand. She is coming into the kitchen to eat with the other dogs but she is still quick to run away if anything isn’t quite right. 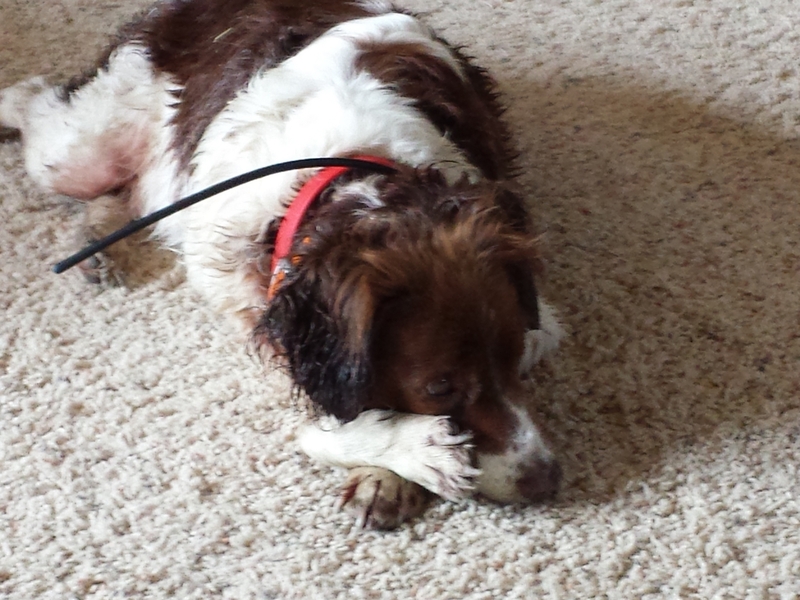 She is eager for her walks, still always on a leash. I have no idea whether or when Mrs J will let her out without it. She will make that call. 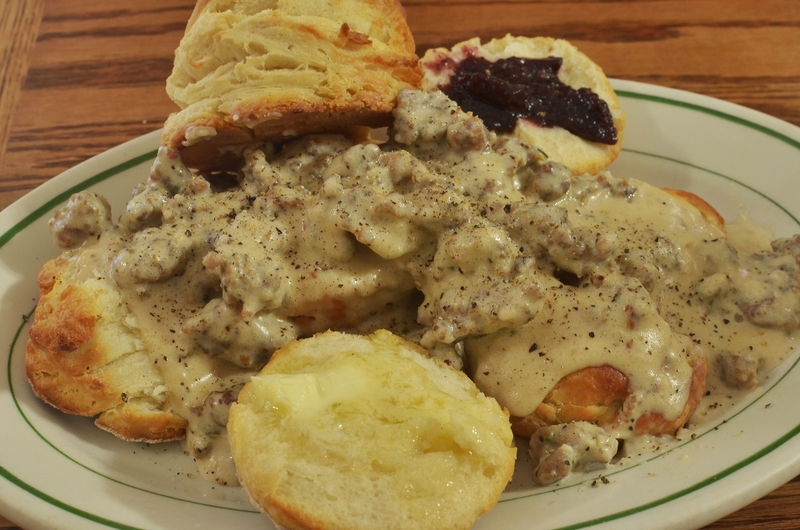 Mmm… biscuits and sausage gravy. These biscuits are another success for this recipe. I fold the dough over on itself several times while kneading it, makes for a nice flaky, layered biscuit. Jack doesn’t get much exposure so here he is with an expression I will make no attempt to characterize. 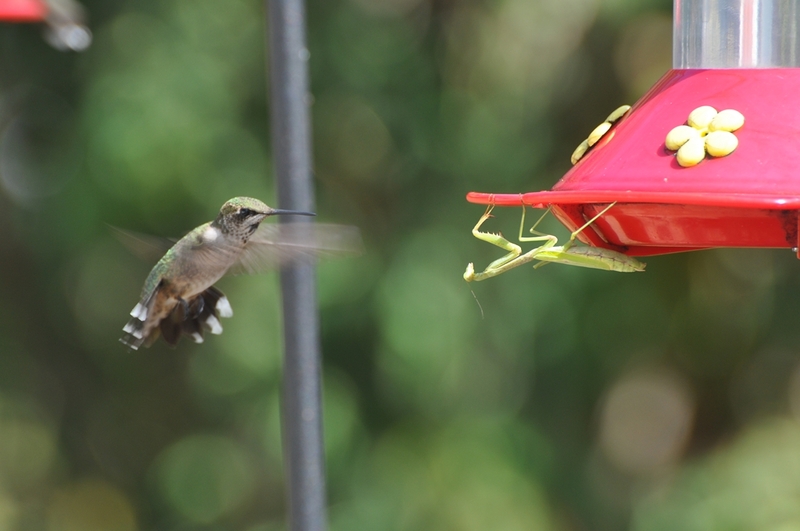 Hummingbirds really hit the nectar feeders hard when rain is threatening. I shot this clip between showers but the rain doesn’t slow them down much. I find it hard to pass up a chance to photograph a rainbow. Yesterday was rainy and overcast all day with showers and thunderstorms. Our good luck that they were nothing like the terrible storms in OK. Just as it was getting dark a stray patch of open sky let through enough sun to form one leg of a bow. The hummers are starting to feed heavily from the nectar feeders, they had been absent for a while – preoccupied with nesting. I just wanted to get this in here because I can never remember when the first birds show other than around tax day sometime. We saw him yesterday and scrambled to get a feeder up but this is the first picture. I sat out on the patio reading with my camera handy for a while this afternoon and took this one. They’ll be swarming before too long. I snapped this one of Bitsy a little before the hummer stopped by. Bitsy is running to catch up to Mrs J, on her way out to add some corn to the feeders and to insert the memory chips into the cameras.